One of the new entrants in the .Net PaaS space is IronFoundry. Tier 3 an enterprise cloud platform for mid-tier, large enterprise and SaaS have come up with Iron Foundry(IF) a port of Cloud Foundry(CF) that is targeted towards Microsoft .Net platform. IF is an implementation of CF that is tightly integrated with the .NET Framework. It can support multiple frameworks, cloud providers, and application services all on a cloud scale platform. Nerddinner was a good fit for this exercise. It is a tiered application with an ASP.Net MVC based front end and MS SQL Server based data access, both supported by Iron Foundry out of box. The process started with setting up an Iron Foundry account that would be used to deploy the application. Since the service is in beta there is no cost incurred during setting up the account. Registration process was trivial but account provisioning was not :) . I tried three email addresses before receiving an account approval mail. The next step was to download the necessary tools to interact with the IF platform. Cloud Foundry Explorer: A windows app to manage your CF instances and services. VMC .NET: Command Line tool for managing CF instances. Visual Studio Extension: This extension allows directly integration of Visual Studio with the IF platform. These tools need to be configured with the account details created earlier. Refer to the documentation for CF Explorer here to understand how to configure user account. Similar configurations are required for Visual Studio extension too. I migrated the Nerddinner (changeset 70027) codebase to github due to my new found interest in git and github. After setting up a new repository, migrating the existing codebase and setting up the clone locally it was time to open the Nerddinner solution in Visual Studio. The Nerddinner solution compiled successfully. I did a local run to make sure that there were no runtime errors. Nerddinner works well out of box without any manual configuration and same was true in my case. Nerddinner stores data in SQL server and the default codebase is configured to run with local SQL Express. I ignored the database requirement for the time being and just went ahead and deployed the application onto Iron Foundry. Deploying the application from Visual Studio was pretty straight forward. 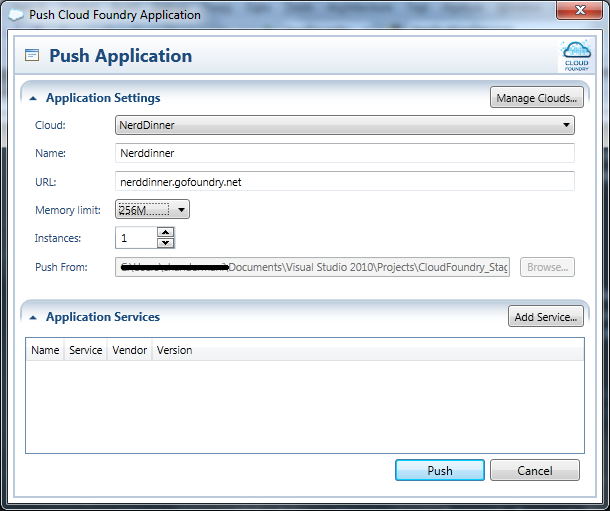 Right click on the ASP.Net MVC project, click ‘Push Cloud Foundry Application..’ (For first time deployment). 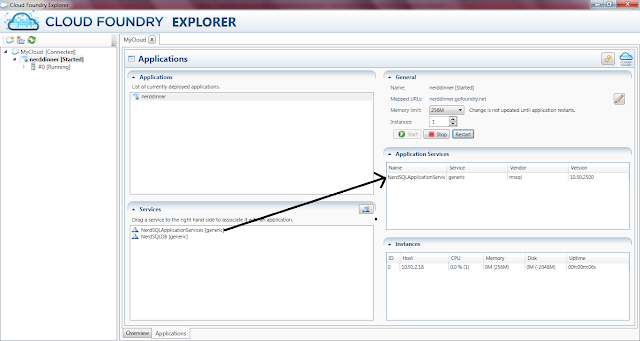 All of the options in this dialog are self-explanatory except the “Application Services” section. I would come back to it later in this post. The application is pushed to IF infrastructure for deployment. The application gets deployed based on the selected configuration and is ready to be used. The last step has its own workflow which I would not dwell in this post. Since IF is a port for CF see this video to understand the deployment complexities involved. 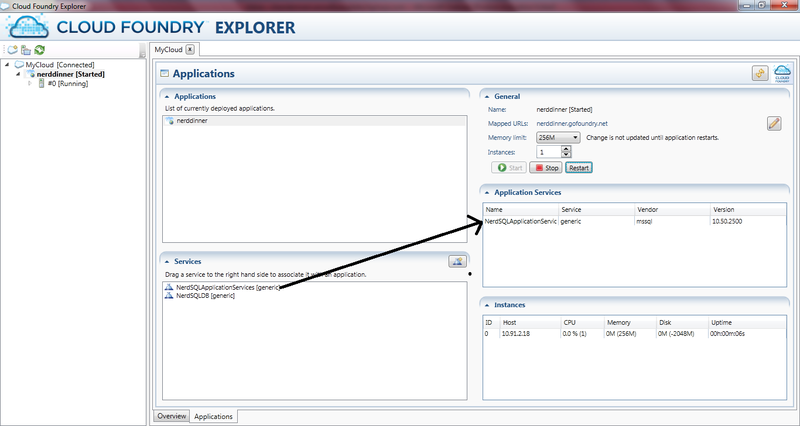 The highlighted area shows the instances of my application running (one in this case). I Fired my browser and typed http://nerddinner.gofoundry.net and voila!!! the application was up and running. In spite of my initial success, I still needed to tackle database integration. As compare to CF services the service offerings in IF are limited and would evolve over time as the platform matures. Meanwhile SQL Database service was available for me to get started. 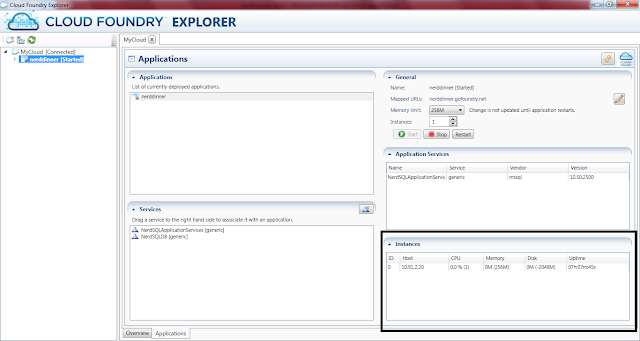 The Services section on the CF explorer allows us to create services for our account. Once a service is created it can be used by multiple deployments. I went ahead and created two MS SQL data service. Another to store SQL Profile, Role and Membership data. Nerddinner uses the standard ASP.Net Membership provider API to support authentication \ authorization. The next step was to associate the two services with my current deployment. This too can be done from the CF explorer. Drag the service to the right hand side to create an association. Although the step above provisioned and associated the database service with my application, I still did not receive any connection information that is needed to connect to the newly provision database. Download the web.config for my application from CF Explorer. Future Improvement: CF explorer should provide a easier mechanism to download connection details. This brings up a dialog which helps us select the application that we want to update. After selecting the appropriate ‘Cloud’ and ‘Application Name’ options click update. My deployment was updated and I had linked my application with correct database but still the database had no schema or data. MS SQL database service currently cannot be access from outside and hence tools such as Management Studio would not work. This made the task of creating database schema on the newly provisioned database little challenging. To solve this problem I went ahead and create database schema script using the existing database provided as part of Nerddinner codebase. I created two scripts one for each Nerddinner DB and aspnet DB. The new scripts have been added to the solution and are part of codebase I have shared at the end of this post. A DatabaseCreator class was created containing methods to run both of these scripts. The method calls were added to global.asax.cs Application_Start event to make the scripts run on application first load. Everything ran smoothly and I now had Nerddinner running smoothly, Hurray !!! You can check out the application at http://nerddinner.gofoundry.net. The code base is available at GitHub here. Upgrades + configuration changes are fast, really fast as compared to Azure. Well suited for web applications. Lack of error logs. There were time when the instances showed down and did not start at all but there was no way to determine what happened. Lack of direct access to database. This makes schema changes difficult. Limited availability of ‘Services’ as compared to CF. Instance customization not available at present. Windows Azure achieves this through startup tasks. IF does not have a storage service similar to Azure (table, blobs) or EC2. As the framework mature I would love to see a migration guide for migrating solutions from Windows Azure to IF. To sum it up Iron Foundry is a promising offering but it is still not ready for prime time consumption. The success of Iron Foundry depends upon its adoption within enterprise, its developer community and the Hosting providers (including Tier 3) who can provide hosted solution over Iron Foundry.